18th-century depiction of the Moloch idol (Der Götze Moloch mit 7 Räumen oder Capellen. "The idol Moloch with seven chambers or chapels"), from Johann Lund's Die Alten Jüdischen Heiligthümer (1711, 1738). Moloch[a] is the biblical name of a Canaanite god associated with child sacrifice. The name of this deity is also sometimes spelled Molech, Milcom, or Malcam. The name Moloch results from a dysphemic vocalisation in the Second Temple period of a theonym based on the root mlk, "king". There are a number of Canaanite gods with names based on this root, which became summarily associated with Moloch, including biblical מַלְכָּם‎ Malkam "Great King" (KJV Milcom), which appears to refer to a god of the Ammonites, as well as Tyrian Melqart and others. Otto Eissfeldt in 1935 argued that mlk was not to be taken as a theonym at all but as a term for a type of fire sacrifice, and that *lĕmōlek "as a molk-sacrifice" had been reinterpreted as the name of a Canaanite idol following the Deuteronomic reform under Josiah (r. 640–609 BC). According to Eissfeldt, this 7th-century reform abolished the child sacrifice that had been happening. Moloch has been used figuratively in English literature from John Milton's Paradise Lost (1667) to Allen Ginsberg's "Howl" (1955), to refer to a person or thing demanding or requiring a very costly sacrifice. Biblical Hebrew מלך (mlk) usually stands for מֶלֶךְ‎ melek "king" (Akkadian malku), but when vocalized as מֹלֶךְ‎ mōlek in the Masoretic Text, it has been traditionally understood as a proper name. While the received Masoretic text dates to the Middle Ages, the existence of the form Ancient Greek: Μολοχ (Molokh, whence Vulgate Moloch) in the Septuagint establishes that the distinction dates to the Second Temple period. Moloch has been traditionally interpreted as the name of a god, possibly a god surnamed "the king" (cf. adon "lord", baʿal "master"), but pejoratively mispronounced as Molek instead of Melek, using the vocalisation of Hebrew בּשֶׁת‎ bosheth "shame", distinguishing it from the title of melek "king", written identically in the consonantal text, which is also frequently given to Yahweh. Thus, in Psalm 5:3, the מלכי mlk-y ("my mlk") of the Hebrew text is vocalized מַלְכִּי malk-ī and translated ὁ βασιλεύς μου ("my king") in the Septuagint; by contrast, in Amos 5:26, מלככם mlk-km ("your (plural) mlk") is vocalized מַלְכְּכֶם malk-chem ("your king") but translated Μολοχ ὑμῶν ("your Moloch") in the Septuagint. The name of the god of the Ammonites is also given as מַלְכָּם malkam ("great king"),) rendered as Milcom in KJV. In 1 Kings 11:7, לְמֹלֶךְ שִׁקֻּץ בְּנֵי עַמֹּֽון‎ (KJV: "for Molech, the abomination of the children of Ammon"), the Septuagint has τῷ βασιλεῖ αὐτῶν εἰδώλῳ υἱῶν Αμμων ("for their king, idol of the sons of Ammon"), while in 1 Kings 11:33 לְמִלְכֹּם אֱלֹהֵי בְנֵֽי־עַמֹּון‎ (KJV: "Milcom the god of the children of Ammon") is translated τῷ βασιλεῖ αὐτῶν προσοχθίσματι υἱῶν Αμμων ("for their king, the abomination of the sons of Ammon"). Leviticus 20:2: "Again, thou shalt say to the children of Israel, Whosoever he be of the children of Israel, or of the strangers that sojourn in Israel, that giveth any of his seed unto Molech; he shall surely be put to death: the people of the land shall stone him with stones." Leviticus 20:3: "And I will set my face against that man, and will cut him off from among his people; because he hath given of his seed unto Molech, to defile my sanctuary, and to profane my holy name." Leviticus 20:4: "And if the people of the land do any ways hide their eyes from the man, when he giveth of his seed unto Molech, and kill him not"
Leviticus 20:5: "Then I will set my face against that man, and against his family, and will cut him off, and all that go a whoring after him, to commit whoredom with Molech, from among their people." 2 Kings 23:10: "And he (King Josiah of Judah) defiled Topheth, which is in the valley of the children of Hinnom, that no man might make his son or his daughter to pass through the fire to Molech." Jeremiah 32:35: "And they built the high places of Baal, which are in the valley of the son of Hinnom, to cause their sons and their daughters to pass through the fire unto Molech which I commanded them not, neither came it into my mind, that they should do this abomination, to cause Judah to sin." The practice of "passing through fire" (`abar ba-'esh עָבַר בָּאֵשׁ‎) associated with the name Moloch in the citations above also occurs without reference to Moloch in Deuteronomy 18:10–13, 2 Kings 16:3 and 21:6 and Ezekiel 20:26,31 and 23:37. Isaiah 30:33 has the vocalization melek ("king"), but this is widely accepted as an omission of the Masoretic correctors: "For Tophet is ordained of old; yea, for the king it is prepared; he hath made it deep and large: the pile thereof is fire and much wood; the breath of the LORD, like a stream of brimstone, doth kindle it." On the other hand, while 1 Kings 11:7 has the vocalization Molek, in "Molech, the abomination of the children of Ammon", this is widely accepted as an error for Malkam (Milcom), the specifically Ammonite idol. The Septuagint uses Μολοχ three times, rendered by KJV as Moloch or Molech, in 2 Kings 23:10, Jeremiah 32:35 (both verses have Masoretic molek, cited above), and Amos 5:26 (where the Masoretic text has melek "king"). In the other instances of Masoretic molek, LXX has βασιλεύς basileus "king". The variant Malkam, rendered by KJV as Milcom, is found only three times in Kings (1 Kings 11:5, 11:33 and 2 Kings 23:13). Malkam is each time specifically mentioned as a god of the Ammonites, while Molek is generally depicted as a god worshipped by the Israelites in the context of the "passing through fire" of their children (with the exception of 1 Kings 11:7, which mentions "Molech, the abomination of the children of Ammon", widely accepted as an error for Malkam). Canonical Christian scriptures refer once to the pagan idol, Moloch (Acts 7:43). The figure of Mōlok appears in the Quran (43:77) as Mālik (مَالِك). Islamic tradition expanded on this enigmatic reference, portraying Malik as the guardian of Hell. In Modern Standard Arabic, the word mālik means "owner". It is used as a male given name. Later commentators have compared these accounts with similar ones from Greek and Latin sources speaking of the offering of children by fire as sacrifices in the Punic city of Carthage, a Phoenician colony. Cleitarchus, Diodorus Siculus and Plutarch all mention burning of children as an offering to Cronus or Saturn, that is to Baal Hammon, the chief god of Carthage. It has been suggested that the practice of child sacrifice may have been exaggerated in Roman post-war propaganda in order to make their arch-enemies seem cruel and less civilized. Freeman in The History of Sicily from the Earliest Times (1894) states that the Carthaginian nobles had acquired and raised children not of their own for the express purpose of sacrificing them to the god. The author states that during the siege, the 200 high-born children were sacrificed in addition to another 300 children who were initially saved from the fire by the sacrifice of these acquired substitutes. ... but with full knowledge and understanding they themselves offered up their own children, and those who had no children would buy little ones from poor people and cut their throats as if they were so many lambs or young birds; meanwhile the mother stood by without a tear or moan; but should she utter a single moan or let fall a single tear, she had to forfeit the money, and her child was sacrificed nevertheless; and the whole area before the statue was filled with a loud noise of flutes and drums that the cries of wailing should not reach the ears of the people. Scholars of the 17th century received from medieval rabbinical tradition the notion that the various gods named mlk "king" in the Hebrew Bible are closely related, if not identical. Early modern scholarship tended to accept the biblical and Greco-Roman accounts of child sacrifice at face value, although there were early suggestions that the biblical account might refer to a symbolic practice, among them an essay by John Selden of 1617 with the suggestion that the phrase h'byr b'sh lmlk "making to pass over the fire to Molek" might have entailed a februation (purification ritual) rather than human sacrifice. Valentin Greissing in 1678 suggested that the vocalisation Molek was modelled after חֹלֵם ḥōlem "dreamer; prophet" to distinguish it from melek "king", presaging the much more influential suggestion by Abraham Geiger (1857) that the vocalisation is a dysphemism modelled after בּשֶׁת bōshet "shame". John Spenser wrote a seminal study on Molek, Lex transitum per ignem, in honorem Molechi prohibens in 1686, initiating the influential interpretation of Molek as a solar deity. Greco-Roman authors describe the Carthaginian practice of child sacrifice as dedicated to Baal Hammon or, in interpretatio graeca, to Cronus. The explicit identification of this Punic deity with the biblical Moloch is modern, suggesting a continuity of the practice of child sacrifice from Iron Age, or possibly Late Bronze Age Canaan to 2nd-century BC Carthage. 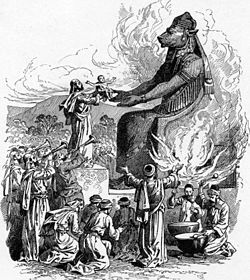 Carthaginian child sacrifice in the context of biblical Moloch is studied, still based on the authority of ancient authors rather than archaeology, by Friedrich Münter in Die Religion der Karthager (1816) and by Franz Karl Movers in Die Phönizier (1841). Both Münter and Movers concluded that Molek was identical with Baal and to be categorized as a fire god. In 1841, both Georg Friedrich Daumer and Friedrich Wilhelm Ghillany published influential works on the topic. These authors came to the conclusion that the biblical text reflects an original identity of Molek and Yahweh, and that the cult of Yahweh grew out of that of Molek, by the abolishing of human sacrifice. The authors find numerous instances of vestigial references to human sacrifice, most notably the law that all firstborns must be "consecrated" or "given" to Yahweh (Book of Exodus 13:2, 22:28). Abraham Geiger (1857) argued that the vocalisation molek was a secondary "dysphemic" correction due to the redactors of the Masoretic text, and argued that there were a further 25 or so instances that should be taken to refer to molek which had been missed by the correctors (and remain vocalised melek in the received text). Of these proposed instances, Isaiah 30:33 has become commonly accepted, while the others have at best found partial support. The hypothesis of Daumer and Ghillany of the original identity of Yahweh and Molek was controversially discussed by widely accepted in mid-19th century scholarship. It was influentially rejected by Wolf Wilhelm Friedrich von Baudissin in his dissertation Jahve et Moloch: sive de ratione inter deum Israelitarum et Molochum intercedente (Leipzig, 1874). Baudissin argued that the theonym Mlk was of genuinely Phoenician (and neither Hebrew nor Assyrian) origin, reflected in Melqart of Tyre and the later reports of child sacrifice in the Tyrian colony of Carthage, and that it was only the import of the cult of the Tyrian Baal (i.e. Melqart) under king Ahab (r. ca. 885–850 BC) that gave rise to his worship among the Israelites (and the corresponding condemnation of the practice by the Yahwist faction represented in the Hebrew Bible). In the early 20th century, scholarly opinion on the topic begins to be informed by the results of archaeological excavations in the Near East, notably those by R. A. S. Macalister at Gezer during 1902–1909. Macalister reported evidence of child sacrifice in Late Bronze Age Canaan. Consensus shifted towards the assumption of widespread child sacrifice in Canaan, although there were dissenting opinions. French-led excavations at Carthage began in 1921, and from 1923 reported finds of a large quantity of urns containing a mixture of animal and children's bones. René Dussaud identified a 4th-century BC stela found in Carthage as depicting a child sacrifice. A temple at Amman (1400–1250 BC) excavated and reported upon by J.B. Hennessy in 1966, shows the possibility of bestial and human sacrifice by fire. While evidence of child sacrifice in Canaan was the object of academic disagreement, with some scholars arguing that merely children's cemeteries had been unearthed, in Carthage, the mixture of children's with animal bones as well as associated epigraphic evidence involving mention of mlk led to a consensus that, at least in Carthage, child sacrifice was indeed common practice. The term mlk in Punic epigraphy was given a re-interpretation by Otto Eissfeldt in 1935. Eissfeldt's suggestion was that molk was not to be taken as a theonym at all but as a term for a type of fire sacrifice. For the Hebrew Bible, he argued that seven out of the eight instances of Masoretic Molek (excising 1 Kings 11:7 as an error for Milkom) should also be regarded as the technical term for child sacrifice rather than as the name of a god, and that *lĕmōlek "as a molk-sacrifice" had been reinterpreted as the name of a Canaanite idol following the Deuteronomic reform under Josiah (r. 640–609 BC). According to Eissfeldt, this 7th-century reform abolished the child sacrifice that had hitherto been an acceptable part of the cult of Yahweh. Paul G. Mosca's Child Sacrifice in Canaanite and Israelite Religion: A Study in Mulk and Molech (1975) similarly argued in support of the theory that child sacrifice (molk) to Yahweh was practiced until the Deuteronomic reform of the 7th century BC. Moshe Weinfield (1972) once again revived the "februarist" position, suggesting that the practice of "passing through fire" prohibited for the Israelites in Leviticus did not refer to actual child sacrifice but to a symbolic rite in which infants were passed across a flame. Smith (1975) responded to this proposal by arguing that the Hebrew phrase implies a translation of "to burn" rather than "to pass between flame". John Day (1989) argued for the existence of a god named Molek based on Ugaritic evidence. In the 21st century the myth of Moloch has been referred to by Asturian political parties with the name of Molloch and also by Iberian patriotic writers specialized in the myth of Saturn, once painted by Francisco Goya, to describe some regional editions based in Barcelona. And black GEHENNA call'd, the Type of Hell." He is listed among the chief of Satan's angels in Book I, and is given a speech at the parliament of Hell in Book 2:43 – 105, where he argues for immediate warfare against God. He later becomes revered as a pagan god on Earth. Then further back, higher than the candelabrum, and much higher than the altar, rose the Moloch, all of iron, and with gaping apertures in his human breast. His outspread wings were stretched upon the wall, his tapering hands reached down to the ground; three black stones bordered by yellow circles represented three eyeballs on his brow, and his bull's head was raised with a terrible effort as if in order to bellow. Chapter 13 describes how, in desperate attempt to call down rain, the image of Moloch was brought to the center of Carthage, how the arms of the image were moved by the pulling of chains by the priests (apparently Flaubert's own invention), and then describes the sacrifices made to Moloch. First grain and animals of various kinds were placed in compartments within the statue (as in the Rabbinic account). Then the children were offered, at first a few, and then more and more. The brazen arms were working more quickly. They paused no longer. Every time that a child was placed in them the priests of Moloch spread out their hands upon him to burden him with the crimes of the people, vociferating: "They are not men but oxen!" and the multitude round about repeated: "Oxen! oxen!" The devout exclaimed: "Lord! eat!" and the priests of Proserpine, complying through terror with the needs of Carthage, muttered the formula: "Pour out rain! bring forth!" The victims, when scarcely at the edge of the opening, disappeared like a drop of water on a red-hot plate, and white smoke rose amid the great scarlet colour. Nevertheless, the appetite of the god was not appeased. He ever wished for more. In order to furnish him with a larger supply, the victims were piled up on his hands with a big chain above them which kept them in their place. Some devout persons had at the beginning wished to count them, to see whether their number corresponded with the days of the solar year; but others were brought, and it was impossible to distinguish them in the giddy motion of the horrible arms. This lasted for a long, indefinite time until the evening. Then the partitions inside assumed a darker glow, and burning flesh could be seen. Some even believed that they could descry hair, limbs, and whole bodies. Night fell; clouds accumulated above the Baal. The funeral-pile, which was flameless now, formed a pyramid of coals up to his knees; completely red like a giant covered with blood, he looked, with his head thrown back, as though he were staggering beneath the weight of his intoxication. Italian director Giovanni Pastrone's silent film Cabiria (1914) was largely based on Salammbô and included an enormous image of Moloch modeled on Flaubert's description. American antisemite and anti-communist agitator Elizabeth Dilling, and her husband Jeremiah Stokes, wrote an antisemitic work, The Plot Against Christianity (1964). Re-released under the title The Jewish Religion: Its Influence Today — with Talmudic writings annotated by Dilling — it quoted Flaubert's description as if it were historically accurate. Information from the novel and film still finds its way into serious writing about Moloch, Melqart, Carthage, and Baal Hammon..
A rhetorical connection between abortion and the child sacrifice to Moloch has been drawn by the anti-abortion movement since the late 19th century. The savage, like ourselves, feels the oppression of his impotence before the powers of Nature; but having in himself nothing that he respects more than Power, he is willing to prostrate himself before his gods, without inquiring whether they are worthy of his worship. Pathetic and very terrible is the long history of cruelty and torture, of degradation and human sacrifice, endured in the hope of placating the jealous gods: surely, the trembling believer thinks, when what is most precious has been freely given, their lust for blood must be appeased, and more will not be required. The religion of Moloch — as such creeds may be generically called — is in essence the cringing submission of the slave, who dare not, even in his heart, allow the thought that his master deserves no adulation. Since the independence of ideals is not yet acknowledged, Power may be freely worshipped, and receive an unlimited respect, despite its wanton infliction of pain. During the growth of vehicle ownership in the United States, the concern for automobile deaths prompted at least one editorial cartoonist to label the automobile "the Modern Moloch," viewing the car as a machine of death. In letters of the Munich Cosmic Circle the name Moloch was used to symbolize a Jewish God, hostile to life. He had called from the depths of defeat the dark and savage furies latent in the most numerous, most serviceable, ruthless, contradictory and ill-starred race in Europe. He had conjured up the fearful idol of an all-devouring Moloch of which he was the priest and incarnation." In Allen Ginsberg's poem "Howl" (1955), Moloch is used as a metaphor for industrial civilization and for America more specifically. The word is repeated many times throughout Part II of the poem, and begins (as an exclamation of "Moloch!") in all but the first and last five stanzas of the section. In H.G. Wells' novel The Time Machine (1895) and subsequent movies, the antagonists were futuristic creatures called 'Morlocks' who routinely ate childlike 'Eloi' (which suggests he was making a biblical analogy). In Fritz Lang's Metropolis (1927), the industrial machinery of the factory is envisioned as a sacrificial temple to Moloch. It lacks the ability to connect hands to heart. At a later period and almost universally the Newts themselves came to accept a different faith, whose origin among them is unknown; this involved adoration of Moloch, whom they visualized as a giant Newt with a human head; they were reported to have enormous submarine idols made of cast iron, manufactured to their orders by Armstrong or Krupp, but no further details ever leaked out of their cultic rituals since they were conducted under water; they were, however, believed to be exceptionally cruel and secret. It would seem that this faith gained ground rapidly because the name Moloch reminded them of the zoological "molche" or the German "Molch," the terms for Newt. In the science fiction show Stargate SG1, Moloch (Moloc) was a Goa'uld who demanded that all female Jaffa (warrior caste among Goa'uld society) in his domain be sacrificed shortly after they were born. He was eventually assassinated by Stargate Command. In Supernatural, Season 12 Episode 18, Sam and Dean Winchester investigate missing youths in Tomahawk, Wisconsin, only to find out they are being sacrificed to Moloch. In the TV series Dirk Gently's Holistic Detective Agency, season 2, Project Moloch is a code name for one of the gifted people kept by the government facility called Blackwing. On the 2012 album Noctourniquet by The Mars Volta, Moloch is mentioned in both the title and the lyrics of the song "Molochwalker". In the TV Series Sleepy Hollow (2013 - 2017) Moloch was the creature that raised the four horsemen in an attempt to start the Apocalypse. The 2018 film Solo: A Star Wars Story has a minor villain named Moloch in the first act. ^ D.D. Hughes, Human Sacrifice in Ancient Greece, London: 1991, S. 115 ff. ^ following a widely-adopted suggestion going back to Abraham Geiger (1857), e.g. "Molech". Britannica Online Encyclopedia. Encyclopædia Britannica Online. 2008. Retrieved 2008-03-22. ^ Amos 5:26 ("ye have borne the tabernacle of your Moloch") is cited in Acts 7:43, as "Yea, ye took up the tabernacle of Moloch" (καὶ ἀνελάβετε τὴν σκηνὴν τοῦ Μολὸχ[...] ὑμῶν), the only occurrence of the name Moloch in the New Testament. ^ a b George C. Heider, Cult of Molek: A Reassessment (1985), p. 10. ^ a b c George C. Heider, Cult of Molek: A Reassessment (1985), 36f. ^ "Then did Solomon build a high place for Chemosh, the abomination of Moab, in the hill that is before Jerusalem, and for Molech, the abomination of the Sons of Ammon." (KJV) Here, למלך lmlk ("for Molech") is vocalized לְמֹלֶךְ lĕ-molek, while the Septuagint translates τῷ βασιλεῖ αὐτῶν "for their king". ^ In addition, 1 Chronicles 8:9 mentions an unrelated Malkam, son of Shaharaim, of the tribe of Benjamin. ^ Of Roman-Carthaginian diplomacy leading up to the final confrontation, A. E. Astin, F. W. Walbank, M. W. Frederiksen, (Rome and the Mediterranean to 133 B.C., Cambridge Ancient History VIII, "Rome and Carthage" 1989:149) note that the sources, "principally Appian and the Epitome of Livy are contaminated by more or less obvious falsehoods, especially the Epitome. The reason for this was of course the desire of contemporary and, even more, of later Romans to justify Rome's conduct". ^ Edward Augustus Freeman (1894). The History of Sicily from the Earliest Times:Volume IV. Oxford University Press. Retrieved 5 December 2011. ^ Attributed, for example, by Moses Margoliouth, A Pilgrimage to the Land of my Fathers 1850:125. ^ George C. Heider, Cult of Molek: A Reassessment (1985), p. 2. ^ Selden, De Dîs Syris (1617), 93f. ^ G. F. Daumer, Der Feuer- und Molech-dienst der alten Hebräer als urväterlicher, legaler, orthodoxer Kultus der Nation, Brunswick (1842). F. W. Ghillany, Die Menschenopfer der alten Hebräer, Nuremberg (1842). ^ Baudissin (d. 1926) continued to publish influential treatises on the subject of Molek for a period of fifty years, notably the relevant articles in Schaff–Herzog Encyclopedia of Religious Knowledge, second and third editions, and substantial chapters in his Adonis and Esmun (1911) and Kyrios (published posthumously in 1929). ^ Friedrich Schwally (1919), see George C. Heider, Cult of Molek: A Reassessment (1985), 24f. ^ Otto Eissfeldt, Molk als Opferbegriff im Punischen und Hebräischen und das Ende des Gottes Moloch (1935). ^ so in B. G. Jefferis, J. L. Nichols, Searchlights on Health: Light on Dark Corners A Complete Sexual Science and a Guide to Purity and Physical Manhood, Advice To Maiden, Wife, And Mother, Love, Courtship, And Marriage (1894), p. 139 ("The abiding interest we feel in the preservation of the morals in our country, constrains us to raise our voice against the daily increasing practice of infanticide, especially before birth. The notoriety this monstrous crime has obtained of late, and the hecatombs of infants that are annually sacrificed to Moloch, to gratify an unlawful passion, are a sufficient justification for our alluding to a painful and delicate subject, which should 'not even be named,' only to correct and admonish the wrong-doers."). ^ 99% Invisible: "The Modern Moloch" PRX. April 3, 2013. ^ Karl und Hanna Wolfskehl – Briefwechsel mit Friedrich Gundolf. Edited by Karlhans Kluncker. Castrum Peregrini Presse, 1977 ISBN 90-6034-032-9 "Aus Anspielungen der Propheten muss man schliessen, dass Moloch von seinen Verehrern mit dem Nationalgott Jahwe kombiniert wurde." González Wagner, C. & Ruiz Cabrero, L.A. (2007). El Sacrificio Molk. Madrid: Ediciones del Orto. ISBN 84-7923-394-X. Grena, G.M. (2004). LMLK—A Mystery Belonging to the King vol. 1. Redondo Beach, California: 4000 Years of Writing History. ISBN 0-9748786-0-X. "Molech". Britannica Online Encyclopedia. Encyclopædia Britannica Online. 2008. Retrieved 2008-03-22. Ruiz Cabrero, L.A. (2008). El Sacrificio Molk entree los fenicio-púnicos. Madrid: Universidad Complutense de Madrid. Servicio de Publicaciones. ISBN 978-84-669-3039-0. Isidore Singer, George A. Barton, "Moloch (Molech)" in Jewish Encyclopedia (1971/2). Moloch, Cult of, Encyclopedia Judaica (1906). F. Gigot, Moloch, in Catholic Encyclopedia (1911). Chisholm, Hugh, ed. (1911). "Moloch" . Encyclopædia Britannica (11th ed.). Cambridge University Press. Look up Moloch in Wiktionary, the free dictionary. A Preliminary Report on the Incirli Stele (Discussion of a stele with Phoenician text which may equate molk/mulk to first-born son). HelgaSeeden, "A tophet in Tyre?" 1991. from Bertyus 39 (American University of Beirut). This page was last edited on 11 April 2019, at 22:19 (UTC).